Almont is home to the headwaters of the Gunnison River. The Taylor River and the East come together to form the Gunnison. These rivers shape and define the small community of Almont. It’s a destination for boaters and fishermen. The first permanent settlers to Almont were the aptly named Fishers, and the town bore their name until 1881. Then, it was named Almont in honor of the leading Hambletonian stallion of the century. During the mining days, Almont was a railroad junction for transporting ore from camps. As the mines closed down and the railroad moved out, Almont went back to its fishing heritage. Many of the old mining settlements still exist. Scenic Drives to visit Pitkin, Tincup, and Ohio City are a great way to revisit that history. Most of the Gunnison Valley’s whitewater outfitters are based in Almont. The Taylor River above and the Gunnison River below offer great rafting and kayaking. Beginners will be most comfortable hiring a guide. Experienced boaters should stop in to a shop, but may be able to run it themselves. The fishing is even better than the rafting in Almont. Be sure to stop in at one of the Fly Shops located in the resorts where the rivers meet. You can pick up supplies, buy your license, and ask about private water. If you’re not sure of where to fish, hiring a guide for a wade trip or a float-fish trip is the way to go. 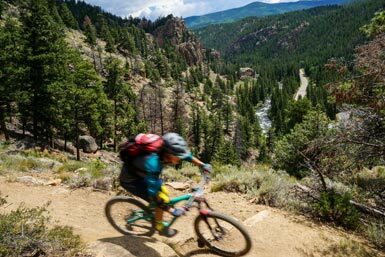 The Gunnison Valley in its entirety is know for its mountain biking. Almont is no exception. Doctor Park trail is among the best downhills in the state and is a few miles up the Taylor Canyon from Three Rivers Resort and Almont Resort. It boasts a 6 mile downhill with just 50 vertical feet of climbing in the middle. Perfection. Enough, by itself, to justify a trip. More mountain biking can be found in the mountains above the Taylor Canyon. Most of these trails are shared with dirt bikes and they connect to dirt mining roads offering great terrain to explore on ATVs. 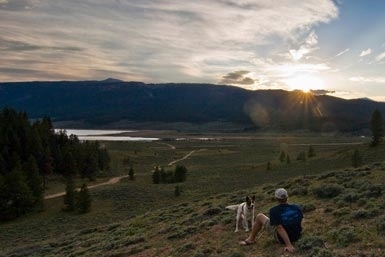 If you’re looking to explore the Gunnison Valley by OHV, Taylor Park should head your list. We would be remiss if we didn’t mention the wildlife viewing, because it’s spectacular. Herds of Rocky Mountain Bighorn Sheep are frequently spotted licking salt along the roads. Bald eagles overwinter near the Roaring Judy Fish Hatchery. Their return every fall is welcomed by locals and visitors alike. The few moose who make the Gunnison Valley home often hang out in the Taylor Canyon.